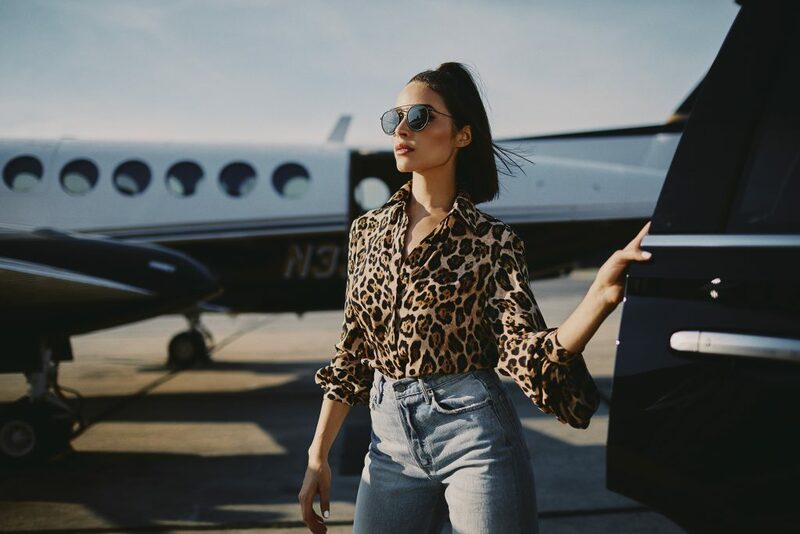 Olivia Culpo has been very busy recently. Her show Model Squad debuted on E! during New York Fashion Week, she just completed principal shooting on a new film with Luke Wilson in Jamaica, and her second capsule collection for Marled by Reunited Clothing is rolling out at retailers like Revolve and Bloomingdales. The Daily caught up with her to find out how she makes it all happen. How did you partnership with Marled by Reunited Clothing come about? They just reached out and said they were interested in collaborating. This is my second collection with them. I am a big fan of their designs in general and I’m a big fan of the team. It’s really important to have great chemistry with people when you’re working on something as personal as a capsule collection; you wanna make sure that your designs are executed and everything is communicated properly and there aren’t any really huge misunderstandings. You kind of merge your visions together so that everybody is happy. Was there anything you learned from your first go-around that you were able to apply this time? Definitely being more particular and finding new ways to communicate exactly what you want is something that I’ve learned a lot more about. I’ve also realized how important it is to test the fit and get as many samples as you can until the final product is put out there, because once it’s out there, you can’t go back. There are always things that you wish you had mentioned or fine-tuned, so it’s just about getting ahead of those issues. How long did you spend working on this collection? Probably eight months. I wanted to make sure that everything was very versatile — that it could be dressed up and dressed down. I wanted it to be accessible at a reasonable price point and I definitely wanted them to be clothes that someone feels good in. I wanted to make sure that the fit was perfect and that these are things that a girl could have in her closet and know how to wear a million different ways. Is the collection based on items already in your wardrobe, or did you design it from scratch? I like to look to the runway [for inspiration], but there’s a ton of different designs and it’s really not just one thing. It’s taking elements from a bunch of different collections — present and past — and putting them together to create something brand new. Are you at all worried about Diet Prada coming for you? No, I’m not worried about that at all. Not even the least bit. I have pretty classic taste to begin with. For example, I designed a red suit, but, of course, there have been a ton of red suits in the past, so it’s not like any one person can say they were the only one that created that. A lot of the pieces are super classic. I have a few cardigans, a pant, two pantsuits, two jogger sets, a few blouses, but everything is classic enough to be a staple in your closet. I’m really excited about seeing more cargo styles, definitely army green cargo pants. Animal prints. Utility boots are also a huge trend right now, and I’m excited to see how people will dress those up this season. Are there any trends you wish would just die already? Not really. There’s nothing that I would say that I really want to end because I know as soon as I say that, I’ll be kicking myself because I’ll fall back in love with it. What else have you been up to these days? I just got back from Jamaica. I was filming a movie there with Luke Wilson called The Swing of Things and that took up a ton of time. So I’ve been doing that and then also launching this whole collection, and then I have another collection that I am also working on right now, getting all of the photos ready for that which is a completely separate project, and then I also have a project in the beauty space coming out that I’ve been kind of fine tuning. And then I’m auditioning as well, so there are so many things going on at once. It’s definitely keeping me busy. Wow! Luke Wilson? That’s cool. Yeah! It’s a comedy. I play opposite Chord Overstreet from Glee. We play a newly engaged couple on our way to our wedding, when we are re-routed to an unknown destination. It’s pretty comical where we end up. I can’t give away too much, but check it out for sure. It’s gonna be really funny. Sounds like your acting career is really taking off. Yeah, it’s going really well. I love it. I’ve been really working on this for a while. I studied communications and acting in college and I’ve always kept up with taking classes and just really fine tuning all of my skills and auditioning, getting rejected so many times and continuing to just do what I love and see how it goes. That’s sort of been my attitude with acting since I ever started and it’s definitely rewarding when things do work out, but as everyone knows, you’re always kind of torturing yourself waiting to hear back because more often than not you’re going to be rejected, but luckily I’ve been able to do some great projects recently like I was just in I Feel Pretty with Amy Schumer, I just had a movie Reprisal with Bruce Willis, and hopefully more to come.